Green Hill Valley Elephant Camp is a sanctuary for retired elephants. Go here to have a personal, rewarding experience with these gentle animals. I LOVE elephants and this was an amazing way to get up close photos of these beautiful, wise-looking creatures. This is a fairly expensive excursion (~$100 USD) and you need a low to moderate fitness level to enjoy it. It’s not too hard – I’m pretty weak sauce and did just fine, but it certainly could be tough for some. Watch out for one exciting part! You can read more about the sanctuary and its mission here. Getting in Reservations needed beforehand as they have to limit the number of interactions to keep the elephants happy. Admission is ~$100 USD, but you know it's a good cause. Best time of day You have to work with the elephants' schedules. 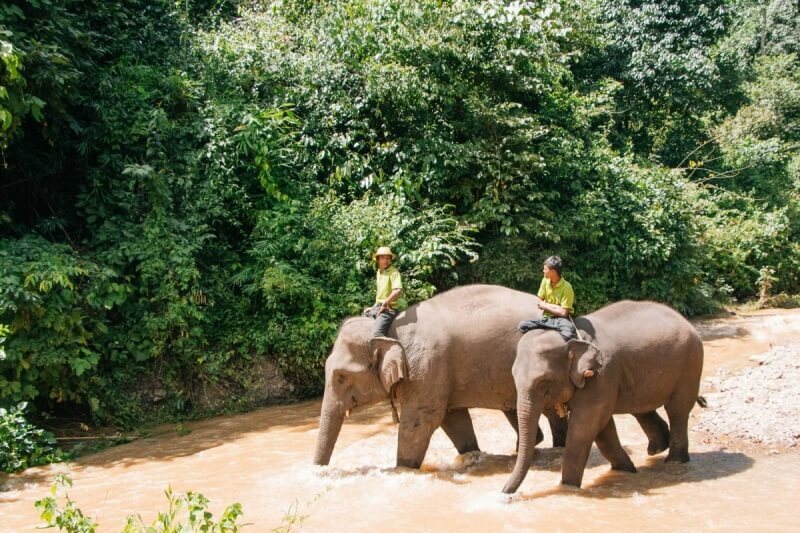 If you want the full experience, arrive before 10am to get to both feed and bathe the elephants. What to wear Wear swimwear underneath and quick drying clothes, you will probably get wet. If you are going to trek, wear a light long-sleeved shirt, hiking shoes and mosquito repellent. They will provide sandals, shorts, and a hat. Best gear Standard recommendation of a walkaround applies here. The sanctuary has a number of visitor options, one with an actual trek. We did the one without a trek, so I’ll be describing that one. When you arrive at the elephant camp, you put away your shoes and any other possessions you don’t want to bring with you into little locked cubbies. They will provide sandals to wear. The monsoons were intense the night before we went so the bridge you cross to get to the elephants had washed away. We had to walk across a raging river holding onto a rope! Okay, it was more of a raging stream but it was about 20-30ft across and felt quite powerful. It was an exhilarating start! When you get to the clearing, you can start feeding the elephants in the little huts. It was a challenge to shoot the dark elephants against the bright sunlight. In these situations, I use manual settings to expose as well as I can for the shaded subject and the background, prioritizing the subject. Then I can shoot away without futzing with the exposure before every single shot. As you can see here, the background is practically blown out because we were in shade. But the elephant is well exposed so it’s still a decent shot. Seeing the mahouts working with the elephants is an experience to itself. They are so comfortable with them, it’s worth it to watch for a good moment between elephant and mahout. As always, I’d rather have a local in the shot than a tourist. Look around and watch for other scenes of interest. I took this shot of a young man prepping the pumpkins to feed the elephants. It was only after the fact that I noticed his nails are painted black! Is he a member of Myanmar’s famous punk scene? Definitely take some time to shoot the elephants up close. It’s rare to get such an opportunity with these animals. Later in the water, it will be hard to get close enough for details without getting your gear wet. After you feed the elephants, it’s time to go down to the river to bathe them. They provide you with special pants to go into the water. But here’s a tip you’ll thank me for, show up with swimwear under your clothes! You can get soaked to your waist. On that note – obviously you don’t want to walk into the river with your unprotected camera. My suggestion on gear is to bring your camera but only use it from the riverbank. The elephants will only be about 10-20 feet away. Bring something waterproof if you want to shoot in the water. I brought a GoPro Session for some memorable videos which I will not share because I am terrible at video. Again, it will be challenging to expose for both the elephant and the sunny reflections off the water. Carefully select an exposure using manual settings and bring back your shadows and highlights in post-process. Another good idea is to use a polarizer. It will reduce the reflections from the plants and give you better greens in your shot. The Hoya HD circular polarizer does an excellent job. It only reduces light by 1 or so stop and is especially hardened to protect your lens. Definitely recommended. The day ends with planting a tree to help with reforestation and a delicious lunch. If you love plants they have a beautiful forested area to shoot as well. I’m not big on botanicals but I shot this lush image of the greenery. The whole experience was really unforgettable, and at least as of today, the most incredible experience I’ve had. I mean like, heart beating faster type stuff – and I’m so glad I have these beautiful photos to capture the moment. If you go, tell me all about it! Share any photos you get at the Green Hill Valley Elephant Camp, or tips on shooting similar subjects.